To mark the opening of our new office we are pleased to help two customers find their dream holiday homes here in Altinkum. We would like to thank Turkish Home Office with the selling of our villa in Didim. The process went extremely smoothly and special thanks go to Andy Cowles who kept us informed throughout the process. If only all reselling was as easy as they made it. Will definitely be telling our friends in Turkey how professional Turkish Home Office were. This is a short message to say a massive “thank you” to Deniz + Andy for their recent excellent work & help to sell our property at Aegean Pine Village in Yesilkent. From day one, they have both acted most professionally, have kept us regularly informed of any relevant information thereby making the transaction so simple for us. This was due to their vast market knowledge & perfect understanding of all of the potential pitfalls + problems. We highly recommend Turkish Home Office, they are totally ethical, completely trustworthy & 100% reliable. PAUL + GLENYS HOLLOWAY. Perfect Dream property buying experience!!!! I felt I had to review Turkish Home Office because not only did my husband and I receive a First Class Service for buying a property from Deniz and walked through every step of the way, but the after sales care is literally second to none. We decided on renovations to our Duplex Penthouse….. to include closing in a second balcony but also plastering walls, replacing showers, extending the kitchen, more plug sockets, putting up ceiling lights and positioning tv’s on walls. Also Deniz has introduced us to his suppliers of furniture, and I have to state, these acquisitions have been at a drastically reduced price. It becomes apparent that where ever you go with Deniz he is respected and very highly thought off within Didim and it’s not surprising as he is not only extremely professional, but he also wants to make sure everything is perfect and all your needs are met. Deniz has a complete list of contractors available to carry out all the renovations, and again I have to state, not only providing an extremely professional service, faultless actually, but also again, at a fraction of the cost. Deniz we cannot thank you enough and cannot recommend you enough. MRS EDWARDS. Rotal marina complex in didim. I wanted to make a comment on the great service you have provided, hence I am forwarding this testimonial. Although it may come a little late, it shows even more your excellent commitment to providing results that customers actually want. “We have nothing but praise for Deniz & his team. Not only that, the after care service is absolutely superb! Thank you to Deniz, Andy & all the team for helping us along every step of the way. Mr & Mrs Salim” marina plaza penthouse apartment buyer. Hope we find you both well. I would like to say a big thank you for the way in which your company handled the sell of our apartment from Mayfair 2 complex Didim. From marketing the apartment through to the completion we where treated very professionally. We would & will be recommending Turkish home office to any future friends that wish to sell or buy a property in Aktinkum. A completely trustworthy and very reliable agency that from the start acted most professionally, kept us regularly informed of any relevant information thereby making us feel very comfortable. We wish you and your team every success in the future. Would like to say how smooth the selling of our apartment was when using ‘turkishhomeoffice’. Deniz and Andy were with us from the beginning and all through the selling process. Even keeping us informed by phone and emails while we were in the uk waiting for the sale to go through by showing people our apartment. > We chose to go back to Turkey to finalise the paperwork and again they were both there taking us to the necessary offices and bank. The transaction went so easy and we couldn’t of coped without them, so again thank you very much for your help and would recommend your company to anyone thinking of buying and selling in Turkey. Kan bara säga allt gott om denna mycket professionella Mäklarfirman som ägs av Deniz Polat. Mycket bra service utöver det vanliga av en trevlig och hjälpsam man! Varför inte köpa en lägenhet i Didim i sydvästra Turkiet? Jag kan intyga er om att vi har aldrig ångrat oss. En vacker stad med kulturminnen mitt i staden, det går inte att jämföra med Alanya eller Antalya där fräcka försäljare försöker pracka på en massa saker! Du kan få en fin lägenhet till bra pris ? Ta gärna kontakt om du vill veta mer. Sold another lovely property for a belguim family in altinkum,Turkey. We would like to thank you for your help during our property purchase and now again during our recent sale. It was a pleasure dealing with you and your team during what can be a stressful time. We would like to thank you for your help during our property purchase and now again during our recent sale. It was a pleasure dealing with you and your team during what can be a stressful time. You guided us each step of the way and followed through on everything you promised. Both our transactions you dealt with were extremely easy and quick and if we are ever in the market for property again, we would definitely come back to you. I would say anybody looking to buy in Turkey, use Deniz for the a trouble free process. I would like to thank Deniz and the Polat group for the speedy handling of the sale of my property. In particular I would like to thank Andy who went out of his way help me deal with everything. Thanks. Altinkum beachront apartments in turkey. We had a property in Apollonium Beach and spa Resort in Turkey, which we have been wanting to sell for a couple of years but had no idea how to go about it. It was a constant source of worry to us and a financial burden. We had a property in Appoloniun Beach and spa Resort in Turkey, which we have been wanting to sell for a couple of years but had no idea how to go about it. It was a constant source of worry to us and a financial burden. Then we contacted Turkey Homes Office in Altinkum to ask if they would be able to sell it for us and we were delighted when they came back to us within the week with a reasonable offer – which we accepted. We were assigned a personal contact, Andy and throughout the process, he was informative, polite, friendly, very professional keeping us abreast of the process at every stage. We felt we could trust him and he took total control of the situation, so that we did not have to worry about anything. Andy recommended we use a Solicitor in London to do the Power of Attorney and this meant that we did not have to travel to Turkey or to London – it was all done via email! Such was the trust built up between us, that Andy transferred a 10% deposit into our bank account before the contracts were signed and then made a further part payment during the process, to show their commitment to the sale..
We were amazed at how speedy and easily the property was sold, with start to completion in 6 weeks and cannot thank Andy enough for guiding us through it, so seamlessly. We would highly recommend any prospective sellers of property abroad to use Turkey home office. They have the knowledge and expertise to sell your property and would save you a lot of expense, time and trouble. We sold our apartment in Turkey. Thanks to deniz and his team at Turkish home office. Three days took it! very happy, highly recommended. Another very smoother sale by turkish home office in august 2015. Sold another great resale aparments to british couple within a week. Very professional, friendly service! Our purchase couldn’t have gone smoother!! Thank you all! My search for a property abroad took me in different places in the world but I have never found that element of trust from the vendors that it is so paramount in such a difficult process. Denis and Andy have gone the extra mile to reassure me and I can see them doing so for all their clients before and after the purchase. I have been a very fussy client but nevertheless they have constantly exceeded my expectations and they still continue to do so. My only regret is that I should have bought sooner! Congratulations to Mark from Hull who came last week and purchased his new home in Altinkum Mark plans to return in May when he retires and become a resident Turkish home Office wish him good luck in his new home and look forward to seeing him back again in Altinkum. We were treated very professionally by Andy and were astounded how quick we sold and bought in 10days.Happy with the service and cannot speak too highly of deniz and his team. Another very happy customers purchased their dream homes abroad via turkish home offfice. Sold our resale apartments via turkish home office within 24 hours and bought a new one next day. To mark the opening of our new office we are pleased to help two customers find their dream holiday homes here in Altinkum here they are receiving their title deeds in our new office Deanea Collingwood from Portsmouth and Valery Cosco from London we wish them good luck and best wishes in their new property from everyone at Turkish Home Office. Enough globe trotting for a while now we’ve found our very own “Place in the Sun”. Thanks to Deniz Polat and Andy cowles for your generous hospitality and assistance. Maybe now we can watch something else on telly! 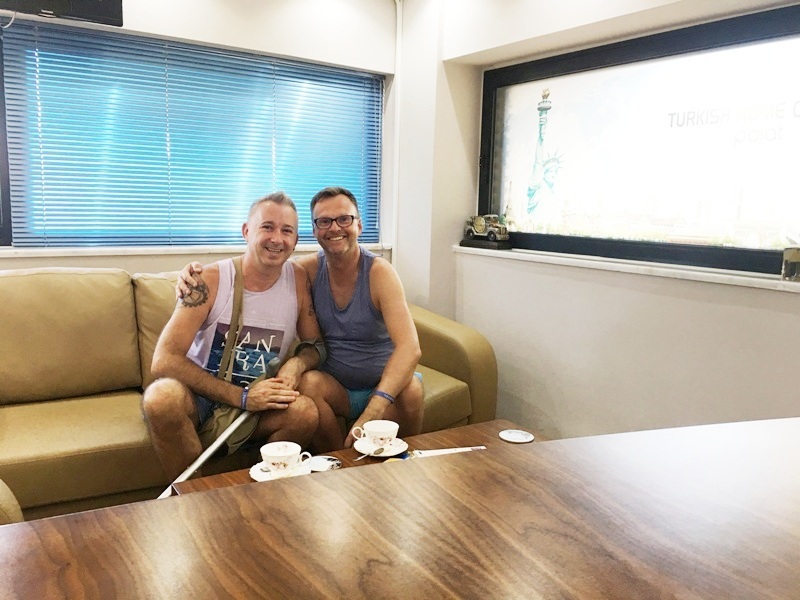 “A Place in the Sun”: Buying Your Dream Home Abroad;We bought our dream homes through Turkish Home Office, and couldn’t be happier with the outcome, we just can’t recommend Deniz and Andy of Turkish Home Office highly enough, they are true professionals! WE sold our villa with Turkish home office, we dealt with Deniz Polat who was very professional and keep us up dated every step of the way. mr polat acted as power of attorney who transferred full amount of the value of our villa to our uk account . We found Turkish Home Office and Mr polat to work as a good team, being trustworthy kind and helpful . Margaret and I would like to thank for the efficient way you dealt with the part exchange of our property in Altinkum Turkey. You picked us up on the morning Saturday the 18th May and we viewed the new property with you. You made us a offer for our property and we agreed to buy. We are delighted with our purchase and your continued support, with our residency and translating the messages we were receiving on our mobile relating to our telephone installation and we cannot thank to Deniz enough for this support. As you were aware I was going back to the UK on the 04th June and returning to Turkey on the 27th June you ensured that the Tapu would be completed for us. Which you did and presented us with the Tapu on Monday the 01st July just 29 working days from us moving in incredible. Once again we cannot thank you enough for all the assistance you gave us guiding us through the administration process and your continued support on any matters albeit how small. You made the buying process in Turkey a pleasure. Another happy customers sold and purchased, their dream homes via turkish homes office in may 2015. Now that we are at home i can now tell you about our experiences with Deniz and Turkish home office staff in Didim. My partner and i had the smoothest transaction ever, Deniz was great to deal with, nothing was to much trouble for him and his staff, they were very efficient and knowledgable and I would recommend this company to anyone thinking of selling or buying ,thank you Deniz for making matters go so smoothly with our purchase of our new appartment. I WOULD highly recommend Turkish Home Office to anyone who I speak to about buying or selling in Didim. I recently sold my 1 bedroom flat to Turkish Home office in Altinkum. It is thanks to the professionalism of Deniz that the whole transaction was completed very quickly and smoothly. On completion of the sale I received the cash in sterling, which meant I didn’t have the hassle of changing the cash on my return and this was much appreciated. I would certainly recommend Turkish Home Office to anyone wishing to buy or sell property, in Turkey, as the whole experience was very stress free. Our relations had already bought an apartment in Akbuk and we had stayed there on holidays for the last couple of years. We were told by our relatives that an apartment had been put up for sale next door and that it may be worth a look. The price was a lot lower than other properties for sale on the complex which were exactly the same. We met Deniz to discuss all aspects of buying and local law etc and he helped us through every stage of the purchase down to the finest details. Arranged the purchase, took us to the tax office to sort out the legalities and also to the TAPU office to rubberstamp the final paperwork. Offered to pick us up at the airport and to ferry us around if needed. Our relations had already bought an apartment in Akbuk and we had stayed there on holidays for the last couple of years. We were told by our relatives that an apartment had been put up for sale next door and that it may be worth a look. The price was a lot lower than other properties for sale on the complex which were exactly the same. It was a very pleasing experience to deal with the Turkish Home Office Staff. They were most helpful in all aspects of purchasing a property in this wonderful healthy part of the world. just to let you know the money came through at 12pm so that was very quick. “We would like to thank Deniz and Liz from the “Turkish Home Office” for their help in selling our property. We where looking for a quick sale at a realistic price and Deniz made us an offer to buy immediately. After a couple of days considering the offer we contacted Deniz to inform him to proceed with the purchase. Deniz then went to his bank and withdrew the agreed amount in Sterling and accompanied us to our Turkish bank. At the bank we paid the money in and arranged a bank transfer to our account in the UK which cleared within 3 working days. After the bank we where then taken to the Notary where we signed over the power of attorney to Deniz allowing him to sell the apartment to any interested party. If I condensed the time the process took it would all have been completed within approximately 2 hours. “We would like to thank Deniz and Liz from the “Turkish Home Office” for their help in selling our property. We where looking for a quick sale at a realistic price and Deniz made us an offer to buy immediately. They are helpful and professional through all the procedures that are required here in Turkey. Just like to thank you for all your help you gave us in the purchase of our apartment. You and your team provided an excellent professional service right from the first viewing to organising all the necessary registrations and help setting up the bank account. It made the transition of completing all the necessary administrative work far less daunting. Thanks to Deniz and Liz at Turkish Home Office for finding me a great buyer for my property in Didim. As a seller there is nothing worse than the agent wasting your time with buyers that don’t fit the property so it was refreshing to find Deniz only brought the right person for the right house. Deniz was also calm and patient with both myself and the buyer and aided us through the process with professional skills and courtesy. A strong recommendation from me as the seller. Our family was looking for a dream house in Turkey since 2010. We did a lot of research , browsed a lot of web sites and looked for information everywhere. Then in 2012, I came across the Turkish Home Office website and after few months met with Liz and Deniz . We were impressed by their professionalism and efficiency. We were very happy with all the advises and guidance both offered us throughout the buying process. Their valuable guidance and services helped us in choosing a beautiful home. 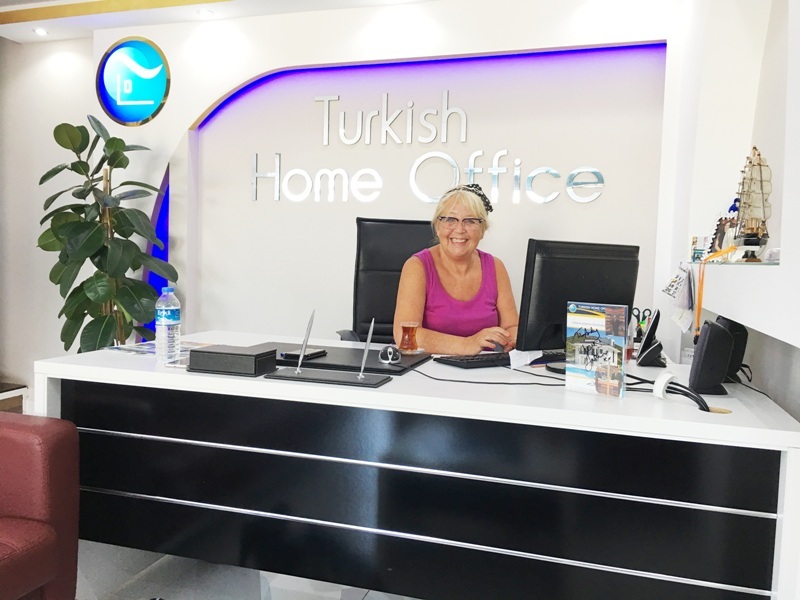 Big thanks to Liz and Deniz for their help and advice from start to end .We strongly recommend the Turkish Home Office to everyone who is looking for reliable and trustworthy service. WE WOULD LIKE TO THANK ALL AT TURKISH HOME OFFICE FOR HELPING US TO BUY A LOVELY APARTMENT IN ALTINKUM. DENIZ GUIDED US THROUGH EVERY STEP OF THE WAY,WHICH MADE BUYING SO EASY. WE WERE KEPT FULLY INFORMED THROUGHOUT,AND DIDN`T FEEL PUSHED AT ANY TIME. DENIZ WAS ALWAYS AVAILABLE AND ANSWERED ALL OUR QUESTIONS HONESTLY. WE WOULD HAVE NO HESITATION IN RECOMMENDING TURKISH HOME OFFICE. SO, IF YOU ARE THINKING OF BUYING PROPERTY IN TURKEY,YOU COULD DO NO BETTER THAN USING DENIZ AND HIS TEAM.TERRY& JEAN SIMPSON FROM MANCHESTER. WE WOULD LIKE TO THANK ALL AT TURKISH HOME OFFICE FOR HELPING US TO BUY A LOVELY APARTMENT IN ALTINKUM. DENIZ GUIDED US THROUGH EVERY STEP OF THE WAY,WHICH MADE BUYING SO EASY. WE WERE KEPT FULLY INFORMED THROUGHOUT,AND DIDN`T FEEL PUSHED AT ANY TIME. all done in one day, money in our bank account and then of to the notary to exchange paper work and all very professionally handled. We were very pleased with the way it went three of our friends also sold their property with him. All we can say he is a very nice and honest man. Brian and Sue. Agean Golf Apartments. Hi this is pete and Kathy we would like to tell you about our purchase of our apartment in turkey . We met deniz Polat to go viewing all day When discussing our needs deniz explained to us perfectly the do”s and dont”s of purchasing in turkey At the end of our viewing deniz took us to the white house restaurant for refreshments the surroundings was very friendly and by that time we had made up our minds.